This is the formal document for canceling a Tax Invoice document. The Tax Invoice is an official document that can not be canceled after handled to the client and therefore, if there is any need to cancel it, the organization should produce a Credit Tax invoice document for the same total charge of the Tax Invoice. This is the only document that represents a cancellation or modification of a deal that was charged in a Tax Invoice. Simple Credit - This credit does not related to any Tax Invoice. This credit is manually updated in the system and is used for fixing customers billing. Credit Tax Invoice - This credit is automatically related and linked to a tax invoice that was produced by the system. It is also linked to the included orders of the tax invoice. Prepaid products Credit - This credit is automatically related and linked to the tax invoice that was produced for the prepay. Create a New Credit Tax Invoice - For further information, please read the next section. Produce a Credit Tax Invoice - For further information Click here. Load Credit Tax Invoice document. For further information Click here. The fields at the top of this screen are used to define the addressee of the document as will be described below. 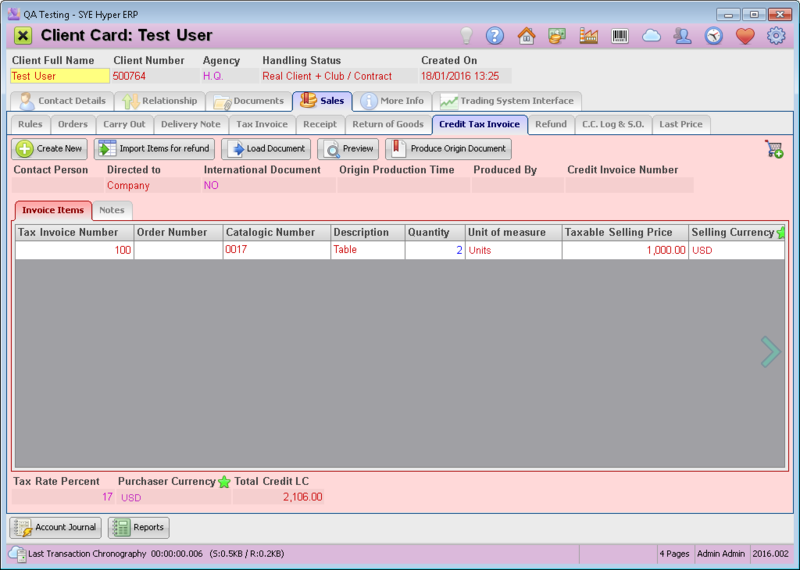 The Invoices Items table, displays the selected items for the Credit Tax Invoice document and includes the items description, quantity and price. Please Note - additional information fields can be displayed according to the users needs and requirements. In order to create a new Credit Tax Invoice, press the Create New button. This action will clear the Invoice Items table. The fields at the top of the table are used to define the addressee of the Credit Tax Invoice. The "contact Person" field is used to choose a person that will be mentioned in the "Intended for" title of the document, while the "Apply To" title will be referred to the company. If this document should be referred to the contact person, choose "Contact Person" in "Directed to" field. In order to add items to the Invoice Items table, use the Import Items for Return button and select the required items from the lists of Tax Invoices / Orders / Prepaid Products / Return of Goods. The selected items will be added to the Returned Items table. Use this button to add additional items to the table. After choosing the the required item, the system will display the selected invoice items. Use the check-boxes to mark the required items for the Credit Tax invoice and press the OK (F6) button. Additional items can be also added by using the Add Product button and using the search wizard. Alternatively, press Ctrl+Enter to add a new row to the table and manually describe an item. In this case, use the symbol to deduct the Tax from the selling price. Tax Rate Percent - The defined tax rate percent. Purchaser Currency - Choose the required currency for the document. A foreign currency will be displayed only for international documents. Total Credit LC - The total credit for the selected items. After choosing the required items, the user can add notes to be displayed on the document. Use the "Notes" tab to add notes or any other relevant information. This tab is also used for modifying the client details (for this document only). In the "Internal Notes" field, the user can write any note for internal use only. The internal notes will not be printed on the document. After adding the required items, use the Preview button to verify the details on the document. In order to produce the Credit Tax Invoice, press the Produce Origin Document button. The system will display a preview of the document. Press the OK (F6) button to approve and produce the document. The system allows to cancel a Return of Goods Note, as described in the next section. Load the required document, using the Load Document button. The canceled Receipt can be retrieved by loading it and pressing the Retrieve Document button. In the Agencies tab of the System Fundamentals, the user can define "Default Notes for Local Credit Invoice", that will be printed on the Credit Invoice document. Using the "Print # Copies for every Original Credit Invoice" field, in the Bookkeeping tab of the System Fundamentals, the user can define how many copies will be automatically printed for every original Credit Invoice. Using the "Number Credit Invoices From" field, in the Bookkeeping tab of the System fundamentals, the user can define the first Tax invoice Number. The Credit Invoices numbering will start from this number. When having foreign clients, the organization can convert the rates to the clients currencies. This can be defined in the "On International Doc Convert to Purchaser Currency" field, in the Bookkeeping tab of the System Fundamentals.